The Palo Verde Valley Times newspaper circulation covers the City of Blythe and surrounding communities of Ehrenberg, Quartzsite, Palo Verde and Ripley. The Palo Verde Valley Times is published Wednesdays and Fridays and is also responsible for producing the Quartzsite Times and Desert Shopper. 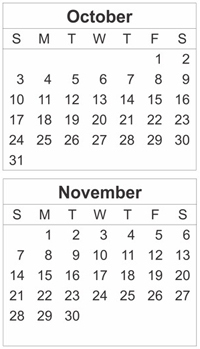 The Palo Verde Valley Times has been publishing since 1925. The Navajo-Hopi Observer is a weekly newspaper containing tribal news, human-interest stories, community events, sports, and school- and health-related information for the Western Navajo tribe and all of the Hopi reservation. The geographical area the Observer covers is the northeast quadrant of Arizona. The Williams-Grand Canyon News has a long history, dating back to 1889. In 1999, it celebrated its 110th anniversary by publishing an historic edition, which included photographs and stories of early Williams and the Grand Canyon. The newspaper is published every Wednesday. The Newspaper Association of America unloaded with both barrels on the U.S. Postal Regulatory Commission's decision to strike a deal with Valassis Direct Mail, giving the latter cheaper postal delivery ("special contract rate") in a new negotiated services agreement. 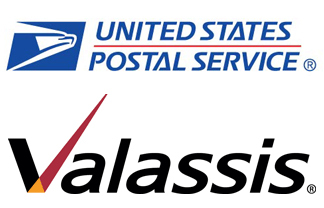 The NAA says the "sweetheart deal" will give Valassis, one of the world's largest direct marketing outfits, an unfair advantage over newspapers and other postal customers. NAA Chairman James M. Moroney III, CEO and Publisher of The Dallas Morning News, stated: "NAA believes this decision is contrary to law and will challenge it immediately and vigorously in the U.S. Court of Appeals for the District of Columbia Circuit." The NAA has already registered its vehement disapproval of the "anti-competitive" agreement with U.S. Postmaster General Patrick R. Donahoe, urging him to cancel the deal immediately. Another blast came from Caroline H. Little, NAA President and CEO, who noted that "the Public Representative appointed by the Commission itself to represent the views of the general public" judged the deal to be "a lose-lose proposition for both the newspaper industry and the Postal Service." The argument pits two financially strapped behemoths, the newspaper business and the U.S. Postal Service, against each other at a time when neither can afford to give up much ground. Earlier this month, the USPS revealed that it posted a $5.2 billion loss in the second quarter of 2012 – up from a $3.1 billion loss in the second quarter of 2011. It also failed to make a scheduled payment to its $5.5 billion employee retiree fund and warned that it will probably fail to make a second scheduled payment in September. Its woes have resulted from a steep decline in the number of pieces of mail delivered, from a peak of 213 billion in 2006 to just 177 billion in 2011. The total volume of standard (marketing) mail delivered every year has tumbled from 103 billion in 2006 to 84 billion pieces in 2011. First-class mail volume has fallen from 98 billion pieces to 73 billion pieces over the same period. Albert Einstein gave the definition of insanity as doing the same thing over and over again and expecting different results. Using this definition, the online publishing industry is a tad nuts. Online publishers often generate new content daily (which is expensive and taxes already overburdened writers), then wonder why revenues are flat. Instead, publishers should harness the power of their content to drive subscriber engagement and generate incremental revenue. To do this, online publishers need to better understand their audience's needs and preferences, then plan content that can be delivered in various formats via a mix of channels over time. If you want to know, just ask. One publisher of a niche industry publication who is embarking on a free daily e-newsletter is concerned that the content will upset readers who pay for the print publication. This provided a great opportunity to discuss the publication's audiences. The publication has a segment of older subscribers who only read the print edition and younger subscribers who prefer email. Younger readers, who are newer in their careers, are interested in reading different content than more seasoned subscribers. Both of these findings are crucial bits of information that help the publisher target audiences based on their reading preferences and life cycle with the publication. The only way to really understand what subscribers prefer is to ask them – and the easiest way to do this is through a customer survey. Surveys can be done online or by phone, but before formulating the questions, talk to a few customers first. From these conversations, you can draft questions that are more targeted and provide more valuable input. Online surveys are generally more successful at generating responses and cost less than phone surveys. Follow the data. Once publishers have a good understanding of their subscribers, they can begin to sketch out the formats and delivery channels that will engage their readers. These can include various channels (social media, email, print) and formats (webinars, e-books, white papers), to name a few. Then the fun begins – planning. Planning is fun because this is how publishers can really drive reader engagement and grow revenues without hiring more staff or stretching current resources. Publishers who regularly cover technology advancements in their industry can go back through the past six months of articles and create content that reviews the biggest technology trends of the year. 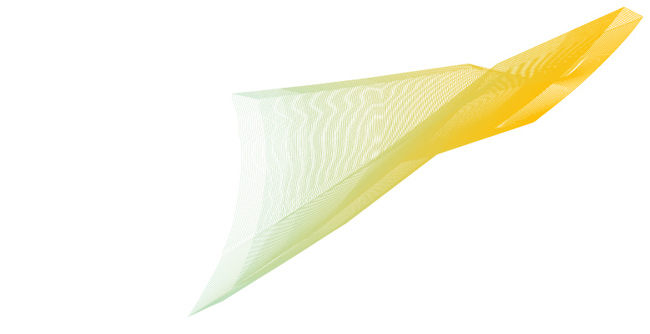 Go through articles to pull out industry best practices and develop a compilation. 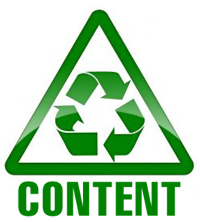 Articles that are part of a series can be combined and turned into new content. Once you identify content opportunities, consider the format and channel that best reaches each segment of your audience. The publisher starting the e-newsletter can easily create compilations of industry trends and offer them via an email series to younger subscribers and as a special pull-out section of the print publication for traditional readers. Both can be underwritten by an advertiser. Going forward, plan content with an eye toward how it can be rolled up or divided into a different format. It might be easier to work backward. For example, if you know that you want to produce a webinar and e-book quarterly, decide on the topic and then plan editorial that will support the topic. Look for ways to integrate the promotions of content and advertisers to underwrite or sponsor each of the formats. By getting to know your customers and planning reusable content, you'll find that both your readers and your advertisers are much more invested in your publication. Your writers and your bottom line will thank you. 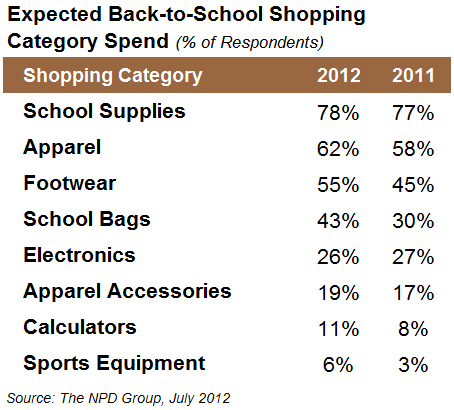 According to The NPD Group's annual back-to-school study of consumers' purchasing intentions for the 2012 season, consumers intend to spend more this year but will start their shopping a little later. Marshal Cohen, Chief Industry Analyst of The NPD Group, says that "Retailers should see a rise in sales when the temperature drops. 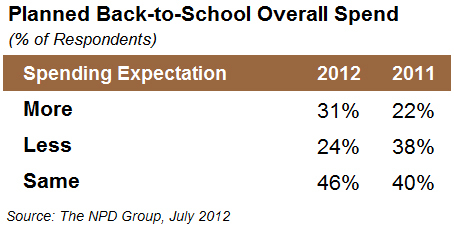 The summer heat wave is a possible contributor to the delay in back-to-school shopping." 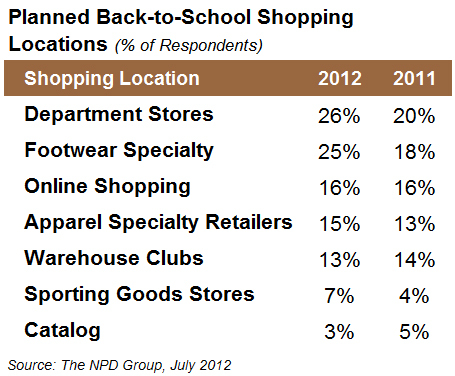 The type of retail outlets consumers intend to shop in has shifted, says the report. As a result, apparel, apparel accessories, footwear, school bags, sports equipment and calculators will receive more attention. Cohen says "In the early stages, school supplies and electronics will do well. When school is back in session, apparel and footwear will drive shoppers to department, sporting goods and specialty stores." 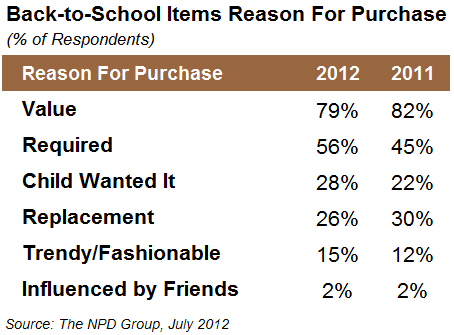 The study shows consumers expect value to remain a key factor in their back-to-school shopping decisions. Shoppers plan to listen to students for reasons to purchase an item, illustrating kids' influence on these seasonal shopping trips.